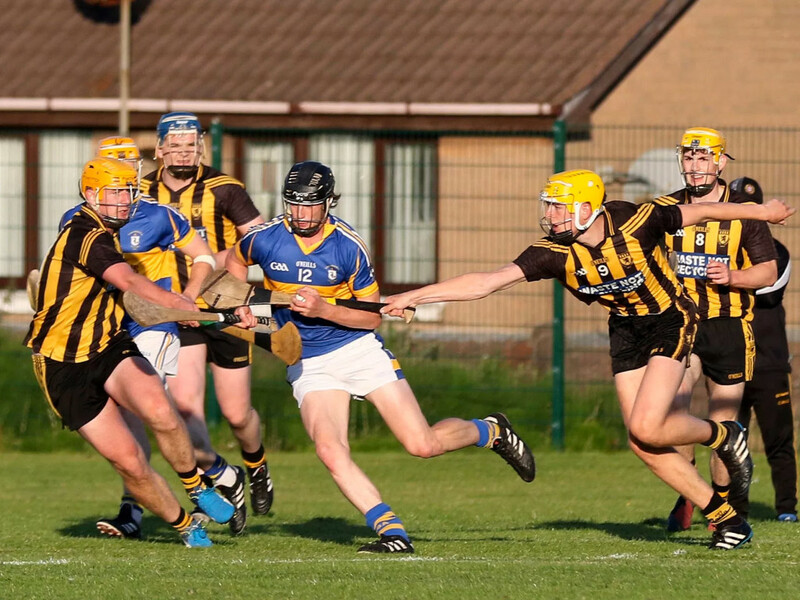 ROSSA secured their Division One status for 2018 thanks to a three-point win over Ballycastle at a sunny Rossa Park last night (Wednesday). The result means the North Antrim club can’t overhaul the West Belfast side given they are now three points adrift with just one game left to play, so it will be Ballycastle who now face the drop to Division Two. These sides are set to meet again in the Championship in a couple of weeks, but given what was at stake last night, there was certainly no ‘dress rehearsal’ feel to this game. Indeed, it was played at a Championship pace with both sides getting tore in from the off and while Rossa led from start to finish, a Ciaran Clarke goal from a free three minutes into injury-time made it a nervy finish. Perhaps it was Ballycastle’s over reliance on Clarke for scores that told some of the story with the sharpshooter responsible for 1-11 of his side’s tally. On the other hand, Rossa had a much healthier spread of scores and their two goals in a minute after the break from Thomas Morgan and Deaglan Murphy proved crucial, yet they had some great performances throughout the field with Chris McGuinness working tirelessly and their back six fighting hard to force turnovers and work the ball forward. The hosts were first on the board when Ciaran Orchin found Michael Armstrong on the right who floated over a fine score and a minute later, McGuinness passed back to Aidan Orchin who drove the ball between the posts. Ballycastle were hurling well in the early stages, but their shooting was to let them down as they hit six early wides although they were on the board through Kevin Barry McShane who gathered at the second attempt and pointed. The sides traded a couple of scores with Murphy converting two frees for the hosts prior to points from Saul McCaughan and Clarke’s opening score of the game from a free. Murphy found himself in with a chance at goal soon after, but his shot was straight at Ryan McGarry who gathered and cleared while at the other end, a long ball dropped over the Rossa defence for McCaughan to whip on first time, but his effort was stopped by Gavin Bell. Rossa were now into their stride however and a second excellent score from Aidan Orchin preceded two from Murphy and another from Stephen Beatty as Rossa moved 0-8 to 0-3 ahead on 20 minutes. A pair of Clarke frees trimmed the gap to three, but Murphy replied with one of his own at the other end before Clarke hit his first from play under pressure out on the left. The desire of the hosts shone through in their next score as Michael Armstrong slid in to contest a ball he had no right to win, but win it he did and controlled well before firing over from range and a Gerard Walsh point soon after made it a five-point game approaching the break. However, Ballycastle were to receive a huge slice of luck as the game moved into added time as a shot for a point from Kevin Barry McShane was dropping short and while Bell stepped out to usher it wide, a combination of the low sun in the Rossa goalkeeper’s eyes and a wicked swerve on the ball saw it drop into the opposite side of the net to bring McQuillan’s right back into the game at the change of ends as they now trailed by just two, 0-11 to 1-6. Such an unlucky break could have unsettled Rossa, but they came out after the break firing and after Thomas Morgan pointed brilliantly from the left to make it a three-point game, they were to soon establish a very healthy lead with two quickfire goals. Firstly, Deaglan Murphy turned his marker and moved in from the right, passed back and Morgan was on hand to control and blast the ball into the net on the half volley. Seconds later, a Gerard Walsh shot from distance broke for Murphy who whipped the ball into the net and suddenly the hosts were 2-12 to 1-6 ahead. Credit to Ballycastle who doubled their efforts after this nightmare start to the second period as they began to claw their way back in. Clarke steadied them with a free just after Murphy’s goal while Caolan McCaughan hit a great score from the left. Murphy clipped over a free at the other end to keep the scoreboard ticking over, but three in-a-row from Clarke, one from play and one a monster free from inside his own 65 left just five between the teams as the momentum switched to the men in black and amber. Rossa needed to settle and Stephen Beatty helped them do that with a good score before Murphy pointed after a turnover to leave the city club 2-15 to 1-11 ahead entering the final quarter. A Clarke free left six in it and the county star had an opportunity from a 20 meter free on 52 minutes to really make a game of it, but his low effort was saved out for a 65 that was subsequently pointed. The visitors stuck to the task with Saul McCaughan and Clarke hitting excellent scores within a minute as suddenly the gap was now just three with six to play. Rossa really needed a score and on 57 minutes, they got just that when Gerard Walsh played in Beatty to fire over. A dropping free was then whipped over by Morgan while Beatty saw his cheeky lob from a tight angle go just outside the post, but an Armstrong point out on the left with the game moving into added time appeared to settle the matter as Rossa led by six once again. However, Ballycastle continued to look for a way back and they were handed a lifeline when Clarke got another chance from a 20 meter free and this time his shot ended up in the net. There was still a couple of minutes to play, but Rossa were not about to let this one slip and they held firm to claim the win, claim the points and claim their place in Division One for 2018. ROSSA: G Bell; N Crossan, E O’Neill, K McDonnell; A Orchin (0-2), S Shannon, A O’Brien; C Orchin, C McIlhatton; C McGuinness, M Armstrong (0-3), S Beatty (0-3); D Murphy (1-7, 0-5 frees), G Walsh (0-1), T Morgan (1-2). Subs: O McVicker for C McIlhatton (60+2). BALLYCASTLE: R McGarry; P McLernon, M Donnelly, O Kearney; B McQuillan, N McAuley, D Donnelly; R McCook, C McCaughan (0-1); J McLister, KB McShane (1-1), C Brown; C Boyd, S McCaughan (0-2), C Clarke (1-11, 1-7 frees, 0-1 65). Subs: J McShane for R McCook (HT), TT Butler for C Brown (35), D McShane for J McLister (37).